As an undergraduate at Carroll College in Helena, Dr. Marchion majored in biology and minored in Spanish. A Montana WWAMI graduate (and a former Lewistown WRITE student! ), she completed her FM residency at the Family Medicine Residency of Idaho (FMRI) and an OB Fellowship at the FMRI Magic Valley Rural Training Track. Her favorite thing is spending time with her young family (dogs included!) 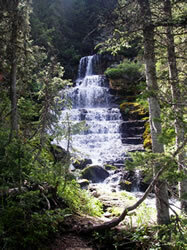 and the many outdoor adventures available in Montana. Leisure activities include reading and traveling. Emergency Medicine: Amy LePage, M.D. • Joan McMahon, M.D . Family Medicine: Annette Comes, M.D. • Cathy Holmes, M.D. • William Holmes, D.O. • Jacob P. Forke, M.D. Clinic: The Medical Arts Building, located at 310 Wendell Avenue, houses several independent physician offices who work as a team, including a surgeon, a radiologist, a podiatrist and two dentists. Family Medicine physicians cover OB. Primary hospital call is shared with all the primary call physicians. Students also work with family physicians at the Central Montana Community Health Clinic. 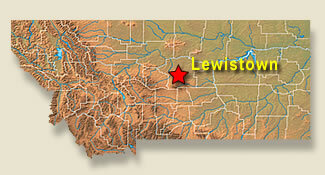 Lewistown has been a WRITE site since 2005 and hosts R/UOP and TRUST students. Nursing Home: Located at the Central Montana Medical Center and adjacent to the Medical Arts Building, the Central Montana Skilled Nursing Center is an 85-bed skilled and intermediate nursing facility that provides 24-hour nursing care, physical therapy, speech therapy, occupational therapy, restorative care services, an activities program with outings, a geriatric day care program, nutritional consultation and meal planning, gardening opportunities and an outdoor courtyard. Physicians see patients at the nursing home. With no psychologists or pediatric or OB/Gyn doctors in town, the Lewistown family medicine physicians offer a traditional family medicine practice, covering all aspects of patient care, from newborn to eldercare. In addition to the FM, Peds, IM, and Psychiatry experiences required by the WRITE program, WRITE students are able to work with other community physicians and in the ER. The Lewistown Community Health Center, led by Dr. Jacob Forke, welcomes WRITE students as well. Consulting specialists visit Lewistown on a regular basis and include a neurologist, orthopedic back surgeon, and two urologists. Two bedrooms, kitchen, basement with laundry, backyard but no garage. The TRUST student will be in Lewistown sharing house at least one weekend during the WRITE experience. Possible that a R/UOP student will overlap a bit in June. No pets allowed. Situated close to downtown and a running trail. Hospital is one mile away (uphill). Transportation: There is an airport in Lewistown which provides service through Skyline Aviation, though most travelers flying into Lewistown opt to use the Billings or Great Falls airports. 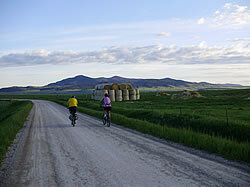 Amtrak service is available across Montana’s Hi-Line with boarding available in Havre, Malta, and other communities. One of the major attractions of Lewistown and the surrounding areas is the opportunity for year-round outdoor recreation. There are bike/hiking trails in and around town, including an extensive line of rails to trails; nearby state and national parks; the hospital has a gym that the students can use for free; skiing at Showdown (two hour drive); lots of snowmobiling in the Snowies and Little Belt mountains; and a new Big Spring Market that has organic food, fresh local produce when available, and fresh bread daily. In addition there is golfing, fishing, hunting, camping, shooting, canoeing, bird watching, rock climbing, skiing, snowmobiling, skating, biking, hiking and wildlife viewing are just a few of the activities which can be done at many nearby sites. Additional sites include the Charlie Russell Chew Choo and historic Lewistown. Average daytime temperature in January is 30° F and the daily temperature averages 70° F in July.